Are you looking to upgrade your existing toilet to a more modern model? Do you want a toilet that has a number of advanced features, yet won’t come with an advanced price? There are a lot of amazing toilets that are available right now and some of them are less than $200. If you’re looking for a new toilet, then here’s some good news: it can be a simple purchase to buy one of the best toilets you’ve ever used. It’s just important to remember a few specific things before you click the “Buy Now” button. What Are the Measurements of Your Bathroom? The first consideration in purchasing a toilet might seem pretty basic, but it’s also the most overlooked item during the average purchase. You’ve got to make sure that your new toilet is going to fit into your space. In order to do this, you’re going to need to measure the rough-in size that’s in your bathroom. You do this by going from the center of the drainpipe that carries away the waste from the toilet to the baseboard of your wall. Make sure you do not measure from any trim, tile, or other addition that has been added to your wall because this will skew your measurement. You can also take this measurement from the center of one of the closet bolts that holds down the toilet flange. Some home setups have four closet bolts in place, which means you’ll need to take your rough-in measurement from the center of one of the rear bolts instead. You’ll also want to measure from the sides of the flange bolts if space is tight to make sure your new toilet’s side measurements will work in the confined space as well. The standard rough-in will be 12 inches, give or take a minor variation here or there. Older homes have a 2 inch variation that’s either smaller or larger [10 to 14 inches] and there’s no real set guide as to how old a home is to what the rough-in measurement will be. You’ll be able to find what measurements work for the modern toilets in these comprehensive reviews. Should You Get One Piece or Two Pieces? 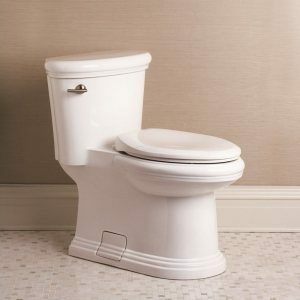 The modern toilet comes in one of two forms: either as an all-in-one toilet that is one piece or it comes with a separated tank that is installed on top of the bowl. This is where cost comes into play because two piece toilets are generally 15-25% cheaper than one-piece models. Both versions of this toilet operate about the same way and require all of the same parts for installation, although the all-in-models are generally a bit easier to clean and maintain. If you do decide to purchase a two piece toilet with a separate tank, make sure that it has a high quality sanitary bar included. This will block any liquid from collecting under the tank at the back of the bowl, particularly urine, which can then degrade the fixture over time because of its acidic nature. An increasingly common option for homes is the wall toilet, which is typically what you’ll find in commercial settings. These toilets are incredibly easy to clean and maintain, keeping the sanitary conditions of the bathroom at an all-time high. On the other hand, most homes are not currently setup for handling a wall-mounted toilet, so there would be changes to the plumbing required, including the waste disposal, in order for this to properly work. Many walls would also need additional bracing to accommodate the added weight of the toilet fixture and the user. You’ll also want to pay attention to the trapway on both styles of toilets. That’s the piece of the toilet that looks a bit like a snake underneath and behind the bowl. This is where the waste water flows toward the disposal tube and it is designed in such a way that it will block sewage odors from escaping the drainage area. Most toilets have a 2 inch trapway that is glazed, but a large trapway of 2 3/8 inches will proactively prevent more clogs from occurring. What Kind of Toilet Bowl Should You Have? There are also two basic types of bowls that you can have on the modern toilet: an elongated bowl or a round bowl. The elongated bowls provide about 2 inches of additional space than the traditional round bowls do and they fit more comfortably while in the seated position. On the other hand, round bowls are generally cheaper than the elongated bowls and round bowl toilets tend to be more compact, letting them fit into tighter spaces. The height of the bowl is also a consideration that must be made. Most toilets are 14-15 inches high when you take the measurement from the floor to the top of the bowl when the seat is up. This is adequate for most applications, but some users may need a taller bowl. There are standard chair heights on modern toilets that go up to 19 inches in height and this is particularly useful for those who have some physical challenges when it comes to sitting on the toilet. If you need an ADA compliant toilet, you’ll need one that is at least 16.5 inches in height. For children or petite adults, however, this may be a little too tall if transfers are not required. Are There Different Flushing Systems To Consider? For the standard toilet, most flushing systems are about the same. You have a tank of water that is released when the trip lever is pressed. This releases water through a canister flushing valve and into the bowl of the toilet, creating the ever familiar swirling pattern in the water. The capacity of the tanks today are about the same, with most having 1.6 gallons or less contained within them to meet WaterSense requirements. What you do have a choice on, however, is the size of the valve and the position of the trip lever on the tank. The trip lever is the handle that you depress to activate the toilet. There are a couple of styles available right now that are pretty common, including the standard lever that is on most toilets. A push button option on the top of the toilet is also becoming more common, while new technology includes hands-free flushing on more advanced toilet models. If you do go for the standard lever because you’re looking for an economical toilet for your home, then you’ll want to get a lever that is positioned at the front of the tank if at all possible. This creates less stress on the working mechanisms within the tank, giving you a longer lasting maintenance-free experience with the chains, whether they’re metal or high grade plastic. The size of the flushing valve is also an important consideration because a larger valve tends to create faster flushing speeds. These are critical to both the cleanliness of the bowl itself and the overall quality of the flush. When combined with an expansive trapway, the larger flushing valves can create a strong flush on just 1.28 gallons that is better than older 3.5 gallon models. Some flushing systems are also assisted by a pressurized flushing system. In these specific toilets, there is pressurized air that forces the water into the bowl at an even faster speed, which breaks up the waste and reduces clogging problems. On the other hand, these toilets are often quite loud and if the air compression system needs repair, it can be quite costly. Other flushing systems utilize gravity to help them flush. Using your own water pressure, these gravity systems help to generate pressure to flush the waste down the system and it uses a siphoning action to complete the flush. Some gravity systems have dual flush options that give you the choice of using a low gallon or standard flush to save even more water, while waterless toilets are becoming more readily available for home installations as well. We’ve compiled a collection of the best flushing toilets to make it easier for you to find one that suits your needs. How Important Is Your Toilet Seat? Although the toilet is extremely important to this entire process, the toilet seat is an equally important component to the installation of a new fixture. If you have a terrible toilet seat, then you’re always going to have an uncomfortable experience that will make you miserable! Who wants that? That’s why investing a little now into a good quality toilet seat that is incredibly comfortable will bring you a lot of joy, even if it does hurt your savings account right now. Most toilets do not come with a toilet seat, even if they claim to be all-in-one fixtures. The first and most obvious consideration is the shape of the seat itself. A round toilet seat won’t work very well on an elongated toilet and vice-versa. The construction of the toilet seat is also an important consideration. Some toilet seats are made from a pressed wood composition, like that cheap furniture you’ll find at a discount store. Others are made from real wood, while cushioned vinyl seats, plastic, or even polypropylene are options. One of the features to consider while shopping for a new toilet is to determine whether or not a slow closing toilet seat is something you should get. These seats eliminate the loud banging and potential damage that can occur from toilet slamming, are a lot safer, and much quieter. This option generally adds a small cost to the toilet, but many households find the feature quite nice. If you’re looking for the best of the best toilet seats that are available today, then you’ll want to consider an upgrade to a bidet toilet seat. These seats are powered, giving you a heated seat that will give you a warm stream of water to enhance your cleanliness. The top models also provide a deodorizer and warm air drying so that you can be completely paperless in the bathroom. Think about how much you spend on toilet paper every year – the average family of 4 uses about $120 worth. That means even a premium toilet seat can pay for itself in 24-36 months by itself. You will need to hook your toilet seat up to a water supply and an electrical supply to get them to work. This might take a little extra effort, but hey – who else do you know that can say they have a remote control toilet? Let us take the confusion out of buying a bidet toilet with our guide to the best bidet systems. Do You Need Any Other Sanitary Devices? There are two basic additions that you can add to a toilet to give your bathroom the complete experience. The first is a urinal, although most homes don’t actually install this fixture because of the changes in plumbing that are typically required. The other addition, a portable bidet, is a highly cost-effective item that can add a lot of value to your bathroom experience. Installation is a snap. Most portable bidets install between the toilet seat and the rim of the toilet using the hard plastic screws that keep the seat in place. Uninstall the toilet seat, place the portable bidet down into position, and then install the toilet seat once again. Connect the bidet to your water line with a T-connector that comes standard and you’re ready for an enhanced level of cleanliness. You are in control. Even the most budget friendly bidet offers a customized experience so that you can get the low level wash or the high powered squirt your particular situation and comfort level may require. You just adjust the knob on the right side of the toilet from your seated position and you’re in business! You still get warm water relief. Even though the basic portable bidet isn’t going to have a heating element with it, you’ll still be able to get some warm relief if you tie it into your hot water line – not always easy to do. You’ll also have to be careful about the level of heat that you get! These portable bidets also come with a number of options that are worth considering. The best option is the oscillating spray that provides a full front-to-back coverage of cleanliness. Another solid option is the self-cleaning nozzle that drips water around itself so that it always provides a hygienic experience. You may also enjoy the self-retracting feature that pulls the spray nozzle out of the way when the bidet is turned to the off position. How Much Water Usage Is Necessary? For most users, a standard toilet is going to come with a flushing power of 1.6 gallons. This is mandatory in some countries, while manufacturers have made it mandatory in other countries. You may find regulations to be more stringent based on water needs in your unique area. Always be sure to consult with local building codes for water conservation needs before purchasing your toilet so that you’re not using too much water and breaking the law. Although the 1.6 gallons is standard, there are high efficiency models that will use just 1.28 gallons per flush on even the toughest waste. Some of these toilets have air compressors, however, which means they are louder than your standard toilet. On the other hand, you’ll get the water savings that you may need! Some high efficiency dual flush toilets take water conservation to the highest of levels, giving you less than 1 gallon of flushing power to eliminate liquid waste. This gives you the options that you need without compromising on the quality of your flushing experience. After all, what good is a high efficiency toilet when you’ve got to flush it three times just to get all of the waste to go down all the way? For some additional considerations, watch this video. It discusses the benefits of low-flush, dual-flush, state-of-the-art toilets and high efficiency toilets! Saving money and water in the long run is always a great idea! What Toilet Is the Best Toilet For You? Selecting the best toilet is an easy task when you’ve got all of the information you need to make an informed decision. Far too often, one of these informational categories is missed during the evaluation process and this creates a preventable problem because the wrong toilet ends up being purchased. By using all of these evaluation criteria, there are fewer instances of having an inadequate toilet being shipped to you. When you choose to make your purchase of a toilet on a website like Amazon, it is also critically important that you immediately inspect your purchase once it arrived. Amazon, for example, has a 30 day return policy in regards to broken items that occur during shipping. Although holding onto a toilet so that it can be installed at the same time as other items that need plumbing work makes sense, if you wait to long, you could end up with a broken toilet that you can’t return. Are you ready to discover the best toilet for your home? Then get started with our guide today!